The Grolier Codex, an ancient document that is among the rarest books in the world, has been regarded with skepticism since it was reportedly unearthed by looters from a cave in Chiapas, Mexico, in the 1960s. But a meticulous new study of the codex has yielded a startling conclusion: The codex is both genuine and likely the most ancient of all surviving manuscripts from ancient America. Stephen Houston, the Dupee Family Professor of Social Science and co-director of the Program in Early Cultures at Brown University, worked with Michael Coe, professor emeritus of archeology and anthropology at Harvard and leader of the research team, along with Mary Miller of Yale and Karl Taube of the University of California-Riverside. They reviewed "all known research on the manuscript," analyzing it "without regard to the politics, academic and otherwise, that have enveloped the Grolier," the team wrote in its study "The Fourth Maya Codex." The paper, published in the journal Maya Archaeology, fills a special section of the publication and includes a lavish facsimile of the codex. The study, Houston said, "is a confirmation that the manuscript, counter to some claims, is quite real. The manuscript was sitting unremarked in a basement of the National Museum in Mexico City, and its history is cloaked in great drama. It was found in a cave in Mexico, and a wealthy Mexican collector, Josué Sáenz, had sent it abroad before its eventual return to the Mexican authorities." For years, academics and specialists have argued about the legitimacy of the Grolier Codex, a legacy the authors trace in the paper. 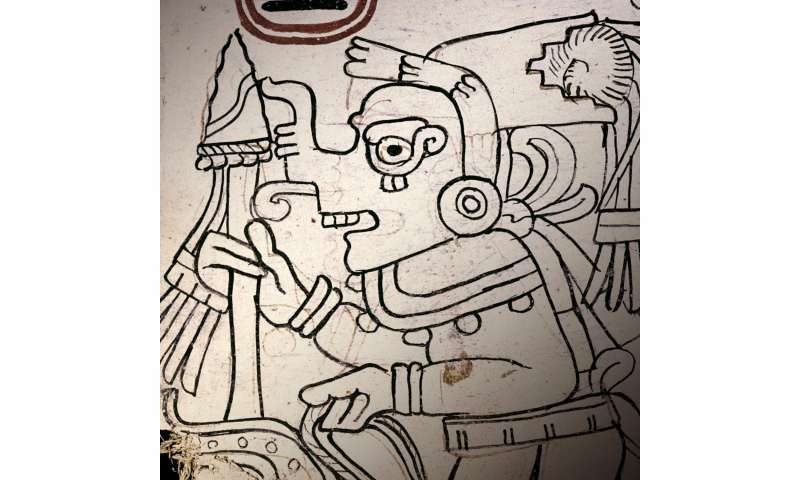 Some asserted that it must have been a forgery, speculating that modern forgers had enough knowledge of Maya writing and materials to create a fake codex at the time the Grolier came to light. The codex was reportedly found in the cave with a cache of six other items, including a small wooden mask and a sacrificial knife with a handle shaped like a clenched fist, the authors write. They add that although all the objects found with the codex have been proven authentic, the fact that looters, rather than archeologists, found the artifacts made specialists in the field reluctant to accept that the document was genuine. Some ridiculed as fantastical Sáenz's account of being contacted about the codex by two looters who took him—in an airplane whose compass was hidden from view by a cloth—to a remote airstrip near Tortuguero, Mexico, to show him their discovery. And there were questions, the authors note, about Sáenz's actions once he possessed the codex. Why did he ship it to the United States, where it was displayed in the spring of 1971 at New York City's Grolier Club, the private club and society of bibliophiles that gives the codex its name, rather than keep it in Mexico? As for the manuscript itself, it differed from authenticated codices in several marked ways, including its relative lack of hieroglyphic text and the prominence of its illustrations. "It became a kind of dogma that this was a fake," Houston continued. "We decided to return and look at it very carefully, to check criticisms one at a time. Now we are issuing a definitive facsimile of the book. There can't be the slightest doubt that the Grolier is genuine." Houston and his co-authors analyzed the origins of the manuscript, the nature of its style and iconography, the nature and meaning of its Venus tables, scientific data—including carbon dating—of the manuscript, and the craftsmanship of the codex, from the way the paper was made to the known practices of Maya painters. Over the course of a 50-page analysis, the authors take up the questions and criticisms leveled by scholars over the last 45 years and describes how the Grolier Codex differs from the three other known ancient Maya manuscripts but nonetheless joins their ranks. Those codices, the Dresden, Madrid and Paris, all named for the cities in which they are now housed, were regarded from the start as genuine, the authors note. All of the codices have calendrical and astronomical elements that track the passage of time via heavenly bodies, assist priests with divination and inform ritualistic practice as well as decisions about such things as when to wage war. Variations among the codices, as well as the assumption that because manuscripts such as the Dresden were authenticated first made them canonical, fed scholars' doubts about the Grolier, according to the study. The Grolier, however, was dated by radiocarbon and predates those codices, according to the authors. The Grolier's composition, from its 13th-century amatl paper, to the thin red sketch lines underlying the paintings and the Maya blue pigments used in them, are fully persuasive, the authors assert. Houston and his coauthors outline what a 20th century forger would have had to know or guess to create the Grolier, and the list is prohibitive: he or she would have to intuit the existence of and then perfectly render deities that had not been discovered in 1964, when any modern forgery would have to have been completed; correctly guess how to create Maya blue, which was not synthesized in a laboratory until Mexican conservation scientists did so in the 1980s; and have a wealth and range of resources at their fingertips that would, in some cases, require knowledge unavailable until recently. The Grolier Codex is a fragment, consisting of 10 painted pages decorated with ritual Maya iconography and a calendar that charts the movement of the planet Venus. Mesoamerican peoples, Houston said, linked the perceived cycles of Venus to particular gods and believed that time was associated with deities. The Venus calendars counted the number of days that lapsed between one heliacal rising of Venus and the next, or days when Venus, the morning star, appeared in the sky before the sun rose. This was important, the authors note, because measuring the planet's cycles could help Maya people create ritual cycles based on astronomical phenomena. The gods depicted in the codex are described by Houston and his colleagues as "workaday gods, deities who must be invoked for the simplest of life's needs: sun, death, K'awiil—a lordly patron and personified lightning—even as they carry out the demands of the 'star' we call Venus. Dresden and Madrid both elucidate a wide range of Maya gods, but in Grolier, all is stripped down to fundamentals." The codex is also, according to the paper's authors, not a markedly beautiful book. "In my view, it isn't a high-end production," Houston said, "not one that would be used in the most literate royal court. The book is more closely focused on images and the meanings they convey." The Grolier Codex, the team argues, is also a "predetermined rather than observational" guide, meaning it declares what "should occur rather than what could be seen through the variable cloud cover of eastern Mesoamerica. With its span of 104 years, the Grolier would have been usable for at least three generations of calendar priest or day-keeper," the authors write. That places the Grolier in a different tradition than the Dresden Codex, which is known for its elaborate notations and calculations, and makes the Grolier suitable for a particular kind of readership, one of moderately high literacy. It may also have served an ethnically and linguistically mixed group, in part Maya, in part linked to the Toltec civilization centered on the ancient city of Tula in Central Mexico. Beyond its useful life as a calendar, the Grolier Codex "retained its value as a sacred work, a desirable target for Spanish inquisitors intent on destroying such manuscripts," the authors wrote in the paper. Created around the time when both Chichen Itza in Yucatán and Tula fell into decline, the codex was created by a scribe working in "difficult times," wrote Houston and his co-authors. Despite his circumstances, the scribe "expressed aspects of weaponry with roots in the pre-classic era, simplified and captured Toltec elements that would be deployed by later artists of Oaxaca and Central Mexico" and did so in such a manner that "not a single detail fails to ring true." "A reasoned weighing of evidence leaves only one possible conclusion: four intact Mayan codices survive from the Precolumbian period, and one of them," Houston and his colleagues wrote, "is the Grolier." My heart still breaks when I think of the burning texts. Perhaps this book was more an almanac. Roman Catholic leaders in South America; ISIS leaders in Syria. Same same. GD religion.